We have a new selection of natural goats milk soap hampers, which would be perfect as unusual Christmas, birthday or Mother's Day gifts. These gift hampers contain a lovely selection of mini botanical goats milk soap bars. The soap slices are a brand new range of soaps, which are larger than the previous round mini soaps. These have been handmade, and are then hand decorated with botanicals or pretty hand crafted soap decorations. The Four Seasons range is a special edition range for 2011, and we only have limited supplies of these so once they're gone... A personalised message may be included free of charge (please say what you'd like printed, in the notes box at the checkout). Remember to also check for skincare gift hamper ideas on our Pamper Hamper page. Our "create your own" gift wrapping service starts from £1.50 + the cost of individual items in each box. This allows you to customise each gift but if you're spoilt for choice, we have already created some popular hampers which may be purchased below. 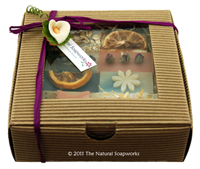 To choose the contents and create your own Pamper Hamper please email us at hampers@naturalsoapworks.co.uk. Includes four botanical goats milk soap slices (half bar sized) with hand decorated tops covered in botanicals or soap decorations. 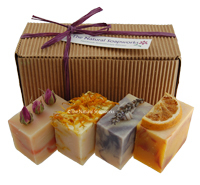 These are supplied as variety hampers, so contents will vary and may include four soaps from lavender, citrus blossom, marigold, rose bud, patchouli, winter jasmine, cinnamon or herbal. presented in a 140 x 60 x 70mm recycled ribbed box with raffia ribbon and flower decoration. Includes four special edition goats milk soaps. There are four soap fragrances - Spring is uplifting with citrus and herbs, Summer is sweet and floral, Autumn is rich and earthy with patchouli, and Winter has hints of amber with frankincense and myrrh. Each mini soap weighs over 35g and is hand decorated with a soap decoration. presented in a 200 x 50 x 40mm ivory box decorated with a beaded leaf decoration and teal organza ribbon. Includes four special edition goats milk soaps. There are four soap fragrances - Spring is uplifting with citrus and herbs, Summer is sweet and floral, Autumn is rich and earthy with patchouli, and Winter has hints of amber with frankincense and myrrh. Each square soap weighs over 85g and is hand decorated with a soap decoration. presented in a 140 x 140 x 140mm ivory box decorated with a beaded leaf decoration and teal organza ribbon. Includes a variety of eight 35g mini goats milk soap slices each hand decorated with pretty botanicals or soap decorations. presented in a 150 x 150 x 50mm recycled ribbed box with raffia ribbon and a dough lily decoration.